In 2017, U.S. insurance companies paid over $700 million to dog bite claimants. Even though medical inflation has been relatively flat since 2003, the dog bite figure has increased over 50 percent during that time. Doctors now have a much better understanding of the physical and emotional wounds that animal attacks cause. Physically, an attacking animal often causes a wide range of serious injuries with its jaws and claws. Emotionally, many dog bite victims suffer Post Traumatic Stress Disorder-type symptoms for many months, or even many years after the attack. Because of the increasing financial value of dog bite claims, insurance company attorneys defend these claims more assertively than ever. Some common legal defenses are outlined below. Florida has a strict liability dog bite law which applies to direct injuries. But the law does not apply to indirect injuries, and these situations are quite common. For example, a dog owner might become distracted because an agitated animal that wants to move from the back seat to the front seat. That distracted driver might cause a car crash. Or, a dog might evade its owner while playing in the yard and run into the street. These kinds of sudden obstacles are especially dangerous to bicycle and motorcycle riders. Simple Negligence: Arguably, allowing an unrestrained animal to ride in a car constitutes a lack of care. If that lack of care causes injury, the animal owner or custodian may be liable for damages. Negligence Per Se: Many Florida municipalities have very strict fence and leash laws. Violation of these laws is a presumption of negligence. Available compensation in Florida dog bite cases usually includes money for economic losses, such as medical bills, and noneconomic losses, such as pain and suffering. 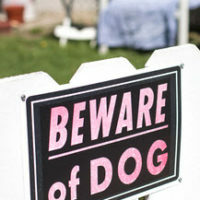 In the dog bite context, assumption of the risk usually means a “Beware of Dog” sign. Contrary to popular myth, these signs do not automatically immunize owners. Instead, the attack must occur within the immediate area of that sign. Moreover, the victim must be able to see the sign, read it, and understand it. Typically, the insurance company bears the burden of proof on each element of assumption of the risk or any other affirmative defense. Aggressive teasing does not constitute provocation. Instead, provocation is a physical act. Moreover, the provocation must be severe enough to legally justify a violent response. So, many courts require repeated acts of provocation. One incident may not be enough. Some people, such as young children, cannot provoke dogs as a matter of law. A good attorney should be ready to meet common insurance company defenses head-on. For a free consultation with an experienced personal injury lawyer in Brandon, contact Reed & Reed. We have four area offices (St. Petersburg, Lakeland, Tampa, and Clearwater).